This article is included in your selections. The Snohomish County Department of Parks and Recreation (Parks) is pleased to present the 2015 Snohomish County Park and Recreation Element (Park Element). As Parks looks back on over fifty years of operation, this Park Element provides a chance to review progress toward achieving Parks’ mission, look ahead to future needs and identify strategies for continuing to realize Parks’ mission. This Park Element is a component of Snohomish County’s Growth Management Act (GMA) Comprehensive Plan (Comprehensive Plan), and is prepared pursuant to Chapter 36.70A of the Revised Code of Washington (RCW). The Comprehensive Plan is comprised of five separate documents, which are: the General Policy Plan (GPP), Future Land Use Map (FLUM), Capital Facilities Plan (CFP), Transportation Element and the Park Element. In previous years, park planning content required by GMA was included in a Comprehensive Park and Recreation Plan, which addressed both RCW requirements as well as planning requirements provided by the Washington State Recreation and Conservation Office (RCO). The RCO is a major grant funding source for park projects and meeting RCO planning requirements helps maintain eligibility for their programs. A separate Park and Recreation Visioning Plan (PRVP) and Park Inventory Report (PIR) have been created which specifically address RCO planning requirements and document Parks’ inventory, respectively. This Park Element is now focused entirely on addressing GMA and RCW based planning requirements. The Park Element works together with the GPP and CFP to provide a long-term strategy for providing park facilities through 2035. The annual Capital Improvement Program (CIP) is created based upon these documents and identifies specific short-term projects to receive funding. The CIP is updated annually and addresses a 6-year planning duration. A separate Park Improvement Plan (PIP) is adopted as a component of the CIP and provides further information on individual park projects. The PRVP contains significant information on public priorities and an overall vision for provision of park facilities that helps guide creation of the Park Element as well as the CIP and PIP. The PRVP is updated at least every six years and provides periodic review of public satisfaction with park facilities and identification of recreation priorities. Parks is committed to including the public in planning for parks and this process allows for consideration of emergent needs and reprioritization based on public interests. The relationship between these park planning documents is illustrated in Figure 1. 1. Urban growth.Encourage development in urban areas where adequate public facilities and services exist or can be provided in an efficient manner. 3. Transportation.Encourage efficient multimodal transportation systems that are based on regional priorities and coordinated with county and city comprehensive plans. 5. Economic development.Encourage economic development throughout the state that is consistent with adopted comprehensive plans, promote economic opportunity for all citizens of this state, especially for unemployed and for disadvantaged persons, promote the retention and expansion of existing businesses and recruitment of new businesses, recognize regional differences impacting economic development opportunities, and encourage growth in areas experiencing insufficient economic growth, all within the capacities of the state’s natural resources, public services, and public facilities. 9. Open space and recreation.Retain open space, enhance recreational opportunities, conserve fish and wildlife habitat, increase access to natural resource lands and water, and develop park and recreation facilities. 10. Environment.Protect the environment and enhance the state’s high quality of life, including air and water quality, and the availability of water. 11. Citizen participation and coordination.Encourage the involvement of citizens in the planning process and ensure coordination between communities and jurisdictions to reconcile conflicts. 12. Public facilities and services.Ensure that those public facilities and services necessary to support development shall be adequate to serve the development at the time the development is available for occupancy and use without decreasing current service levels below locally established minimum standards. 13. Historic preservation.Identify and encourage the preservation of lands, sites, and structures, that have historical or archaeological significance. GMA requirements specific to development of Park and Recreation Elements are provided in RCW 36.70A.070(8). These requirements are listed in the Preface section of this document, along with identification of where content satisfying the requirements are located. 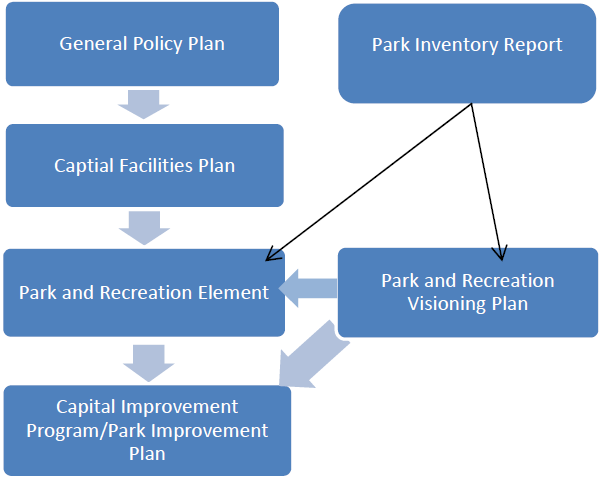 This Park Element is also structured to addresses the majority of GMA requirements for development of Capital Facilities Plans, as they relate to park facilities. GMA requirements for Capital Facilities Plans are also listed in the Preface section of this document, along with identification of where park related content satisfying these requirements is provided. The GMA requires that jurisdictions planning under the act consider projected demand and need for at least a ten-year period and identify funding to meet that need. The identification of need is to be based upon an evaluation of current inventory, projected demand, opportunities for intergovernmental coordination and evaluation of facilities required to meet that need. Recommendations for implementation of this process are contained within the Washington Administrative Code (WAC) for Park and Recreation and Capital Facilities Elements (365-196-440 and 365-196-415 respectively). Specific to creation of the Park Element, the WAC recommends that the process be started with a visioning exercise to “…engage the public in the process of identifying needs, evaluating their satisfaction with existing recreational opportunities, and developing goals to guide the development of the parks and recreation element.” (Washington State, 2010) The results of this visioning process are contained within the PRVP and help guide creation of this document. This Park Element is based upon, and consistent with, policies provided in the GPP, Snohomish County Tomorrow Countywide Planning Policies (CPP) and Puget Sound Regional Council Multicounty Planning Policies (MPP). These three sources represent different layers of geographic consideration and range from planning for the Central Puget Sound Region (King, Kitsap, Pierce and Snohomish Counties), to Snohomish County boundaries (including cities, towns and tribal areas), to unincorporated Snohomish County alone. The MPP are used to guide and inform both countywide policies, which are provided by Snohomish County Tomorrow (SCT), and county-specific policies, which are contained within the GPP. The most recent compilation of the CPP was adopted in 2011 and was developed by Snohomish County Tomorrow (SCT), a forum comprised of representatives from the nineteen Snohomish County cities and towns, Snohomish County and the Tulalip Tribes. The objective of this group is to develop policies for the purpose of encouraging consistency between city and county comprehensive planning. The CPP is adopted by Snohomish County Council and is periodically updated, as needed. The CPP does not include specific policies related to parks and recreation, but policies are provided related to the natural environment, economic development, transportation and public services and facilities, all of which relate to provision of parks in some way. The function of the document is “[To] more clearly distinguish between the roles and responsibilities of the county, cities, Tribes, state and other governmental agencies in managing Snohomish County’s future growth, and to ensure greater interjurisdictional cooperation and coordination in the provision of services” (Snohomish County Tomorrow, 1990). The GPP is based upon, and consistent with the MPP and CPP. The GPP provides county-specific policy direction and includes a separate chapter specific to provision of park facilities. Goals, objectives and policies are provided within this chapter and provide guidance on: interjurisdictional coordination, specific park classifications, facility provision and use, level-of-service standards, land acquisition, open space/natural areas, recreation programs, cultural resources and long-term viability. This chapter most specifically guides formation of this Park Element. In addition to the park chapter of the GPP, other goals, objectives and policies provided within the Population and Employment, Land Use, Transportation, Economic Development, Natural Environment, and Interjurisdictional Coordination chapters relate to, and guide portions of this Park Element. A complete listing of properties managed by Parks is provided within the PIR. Parks’ inventory changes regularly so is contained in a separate document that can be updated as needed (an annual update is anticipated to be typically completed). A summary matrix is provided within the PIR which lists each park facility alphabetically and includes information on classification and general amenities. The PIR also includes an overview map, showing distribution of county parks throughout the county, as well as individual park maps and site information. Analysis contained within this Park Element is based on the December 2013 PIR. A map showing recreation facilities provided by other jurisdictions is located in Appendix B of this document. This map identifies state, city and town provided parks, Washington State Department of Natural Resource (DNR) and United States Forest Service holdings as well as school sites, which often provide recreational features that are used by the public. This information is provided to show the total availability of recreation opportunities in Snohomish County. The Snohomish County Department of Public Works (Public Works) maintains a Bicycle Facility System map, which identifies existing and planned bikeways, which can be separated, multi-use trails such as the Centennial, Interurban and Whitehorse Trails, designated on-street bicycle lanes, designated routes on widened county road shoulders and streets, and roads with shared roadway use that do not include special markings or signs. Public Works’ system integrates Parks’ current and planned trails data and helps identify connections between Parks provided trails and Public Works provided bike routes. Public Works generally maintains management over bike facilities that are located within county right-of-way and are directly connected to the roadway system. Parks’ management of facilities within this system is typically for trail routes that are separated from the roadway system and are designed for multi-modal use. Overlap between these two types of corridors does occur and Parks and Public Works often collaborate on facilities that address priorities of both Departments. Parks coordinates with Public Works to identify trail/bicycle facility needs and make connections between the systems, as appropriate. Parks utilizes a classification scheme, which is based on several factors, including park location, size, access and service area. Providing a classification system park lands is not a requirement of the GMA, but it does help Parks group properties according to their use and management and provides a means of evaluating the provision and distribution of different types of recreation facilities. It is understood that individual parks may function as more than one classification type, especially for residents located in close proximity to the park, but the classifications are intended to represent the more generalized use of the facility. The categories Parks uses are as follows: Neighborhood, Community, Regional, Open Space/Preserve, Special Use, and Regional Trails. The following classification descriptions have been refined from those used in the 2007 Snohomish County Comprehensive Park and Recreation Plan, in order to provide clearer definitions of the groups. This refinement has triggered some parks to change classification, or classifications of some parks may have changed because the factors used to define them may have changed (e.g. UGA boundaries). Similarly, the classification of some undeveloped park sites may have changed since the 2007 Snohomish County Comprehensive Park and Recreation Plan, based on a revised vision of what those properties are anticipated to be used for. NEIGHBORHOOD PARKSNeighborhood Parks are generally smaller facilities that are located within residential areas and/or UGAs and are typically accessible by foot. These parks provide open space for nearby residents and are often a focal point for the neighborhood. Recreational activities in Neighborhood Parks are variable and may include multiple features, or the park may be limited to a single feature, such as playground or soft surface trail. In some instances, Neighborhood Parks may not provide public access, and primarily serve to provide open space, but because of their location within developed areas, they serve a neighborhood function. The county encourages and promotes the transfer of Neighborhood Parks in incorporated and UGAs or to the cities or towns within whose boundaries, or potential annexation area, they are located. Neighborhood Parks are typically of smaller size, although the current average size of a Neighborhood Parks is 21 acres. This higher average is a reflection of several properties included within this classification that are larger, open space, parcels. Developed Neighborhood Parks are typically smaller. The reduced size of developed Neighborhood Parks often limits the number of amenities offered at these facilities. Because Neighborhood Parks are located in residential areas, access, if provided, is predominately by foot and limited parking is offered. A generally defined service area for Neighborhood Parks is ¼ mile. COMMUNITY PARKSCommunity Parks provide the setting for community activities and provide recreational opportunities for both children and adults. Recreational features in Community Parks are typically a mix of types and are selected based upon community input and on an effort to provide both passive and active recreational opportunities. Typical Community Park amenities include picnic tables, benches, shelters, open play, playgrounds, trails, ballfields and sport courts. Community Parks are typically located in incorporated areas, UGAs, or in areas expected to become UGAs at some point, although exceptions to this guideline exist. The average size of a Community Park is 32 acres, but in some instances, a Community Park may be smaller if, for example, it is provided in a densely developed area, or if it provides waterfront access. Because Community Parks are typically located in urban areas, access to the park may be via foot, car or public transportation. Community Parks are generally considered to serve residents residing within a 5-mile radius. REGIONAL PARKSRegional parks are typically identified by unique features or amenities that attract users from a wide area. Regional parks provide the opportunity for individuals to get out and enjoy a longer duration park visit and often offer the opportunity to experience some of the fantastic natural features of Snohomish County. These parks may be located anywhere in the county and typically include a feature such as a boat launch, water access, camping or equestrian facilities. These parks offer destination recreation and the amenities provided are sometimes fee-based (e.g. camping and boat launches). The size of a Regional Park and its primary route of access are inconsequential to these types of parks, as it is the features and service area which predominantly define this classification. Because of this definition, Regional Parks are considered to serve residents from all over the county. OPEN SPACE/PRESERVEOpen Space/Preserve parks focus on preserving wilderness, special natural areas or wildlife habitat, and/or unique qualities of open space. Preservation of open space has innumerable benefits to our community, including habitat values, carbon sequestration, and others (see Appendix A – The Benefits of Parks). Such areas are often planned for preservation in their natural state and management plans for these sites are focused on protecting natural habitat values while providing access to the public, when appropriate. Access to Open Space/Preserve Parks is determined on a case-by-case basis, but is provided whenever possible in order to provide contact with natural environments, promote the importance of open space, educate the public about habitat values and promote an appreciation for natural spaces. These parks remain essentially unimproved and development is limited to that which is appropriate to support the level of public access provided to the property. Open Space/Preserve properties may be located anywhere in the county (incorporated or unincorporated) and amenities, if any, typically affect a small portion of the property. Access to Open Space/Preserve properties will vary upon location and may be via foot, if located near development, or via car if located more remotely. A service area for Open Space/Preserve Parks is not commonly defined, but benefits of these properties typically include provision of habitat functions, open space preservation, air quality improvement, stormwater infiltration, flood attenuation in some cases, as well as other benefits. SPECIAL USESpecial Use Parks typically have one dominant, specialized amenity that users are willing to travel for. These parks most commonly serve that portion of the population which is interested in the amenity the facility offers. However, these types of facilities also often have potential for revenue generation, which can be used to support the larger park system. Special Use facilities may be located anywhere in the county and access to these sites is variable, depending on location. The size of these parks is also variable and needs to be of sufficient size to support the provided amenity. A service area is not defined for these types of facilities. REGIONAL TRAILSThe Regional Trails classification applies to ‘linear parks’ that provide regional connections for walkers, bicyclists, equestrians and hikers. Regional Trails offer immense recreation opportunities and encourage active lifestyles and alternative transportation use. Regional Trails are immensely popular and are the top feature requested by park users, both at the state and county level. Regional Trails may complement or provide opportunities to interconnect with existing or proposed federal, state and local community trail systems or destinations. Regional Trails often provide staging areas, rest/picnic areas, trailheads and interpretive stations. Parks in the Regional Trail classification may be located anywhere in the county, but to be included in this classification, these facilities should extend at least one mile and have a preferable minimum width of 12 feet. Regional Trails in this classification are often rail conversion properties, rail-banked, or, in the case of a planned Centennial Trail acquisition, trail and rail corridor together. This segment is planned to be developed as Snohomish County’s first rails-with-trails project with continued active rail use. The service area for Regional Trail facilities is considered to be countywide as users often travel within the county to use them. •Change in use of the facility – For example, the facility may draw users from a wider or narrower distance than originally intended, or access may be provided to a facility that was historically used for open space provision only. •Change in planned use of the facility – A particular facility may have previously been envisioned for a specific use, which then changed due to shifting priorities, new opportunities, or emerging needs. •Incorporation of the facility into urban areas – As city limits and UGAs expand, growth may encompass a park that had previously been located in a more rural area. Active – Active recreation amenities are amenities which generally promote an elevated heart rate, when used. Amenities which are considered to be active, include: ballfields, sport courts, playgrounds and equestrian facilities. Passive – Passive recreation amenities are amenities which do not generally promote an elevated heart rate when used. Amenities which are considered to be passive include: picnic facilities, off-leash dog areas, amphitheaters and community gardens. Park based trails are also included as passive facilities although it is acknowledged that use of trails certainly can promote increased heart rate. Many of the facilities in the Snohomish County Park system were developed in the 1960’s and 1970’s and have reached the point of needing renovation. Parks that fall into this category include: Kayak Point, Flowing Lake, Wenberg, the Evergreen State Fairgrounds, River Meadows, and Squire Creek. Interestingly, this list of aging parks also includes the entire list of camping facilities, which are a profit center for the department. Due to the age of these facilities, repairs at these parks are increasingly common and Parks’ campgrounds do not always include the modern amenities campers are looking for (e.g. increased power, internet access and larger camp sites). Typical on-going repairs at aging facilities include water and power issues, asphalt cracking, and stormwater related concerns. Larger issues related to these older facilities also often include awkward Americans with Disabilities Act (ADA) retrofits and lack of stormwater treatment. Renovations are needed at these facilities to replace aging infrastructure, to fully incorporate ADA accessibility and to address stormwater treatment and detention, all to support the goals of providing a quality visitor experience, operating in a sustainable manner and of reducing operation costs and maintenance needs. The age of the Evergreen State Fairgrounds (Fairgrounds) presents a particular concern. Buildings at this facility (besides the Shanahan cabin, which dates to 1900) range in date of construction from 1948 to the addition of the Gary D. Weikel Event Center in 2011. Over half of the main structures were built before 1980, including significant buildings such as the Grandstands, Commercial Building and Indoor Arena. A Redevelopment Initiative was developed for the Fairgrounds and identified building and facility challenges including “the lack of usable space of several buildings, the impacts of deferred maintenance on existing buildings, and the lack of capital funding resources to upgrade, replace and/or develop buildings and facilities” (Snohomish County Department of Parks & Recreation, 2009). The Fairgrounds include approximately fifty-four buildings, seven of which were recommended for demolition in the Redevelopment Initiative. In 2011, three of these structures were demolished and replaced with a single, open span, multipurpose building, utilizing federal recovery zone economic development bonds, which are being paid back with revenue from rental of the facility. Construction of this new building has initiated efforts to reinvest in the Fairgrounds, although funding for future, needed upgrades has not been identified at this time. Currently, an updated master plan is being completed for the Fairgrounds and is anticipated to identify priority needs for renovation. Another facility which presents unique problems due to its age is the pool at McCollum Park. McCollum Pool has been a popular amenity for the South Everett/Mill Creek community since the late 1960’s. McCollum Park is a beautiful natural setting for this outdoor pool and many citizens have passionate memories of the facility and feel a strong attachment to this venue. McCollum Pool has been maintained so the typical pool-user is not aware of many problems with the facility. However, the pool does show signs of deterioration and parts for the pool’s failing mechanical systems were assessed in 2011 to have less than five year’s life remaining. Many users do notice that the pool house is showing its age and that the pool liner/shell is facing eminent structural failure. Repairs to the pool are complicated due to the siting of the facility. Originally built on an old landfill, the area is continually settling, compromising the park and pool. Restrictions on how landfills can be used also complicate considerations of replacement of this facility. The age of the Parks system also means that modern efficiencies in power fixtures and building components are not necessarily incorporated into all facilities. For example, newer light fixtures can reduce power needs, as can on-demand water heaters and improved insulation and windows. Low-flow toilets and targeted irrigation systems can reduce water consumption. Piecemeal retrofits have been made at some parks as the opportunity has presented itself, but whole-facility renovations are needed to incorporate efficiencies and reduce overall operating impacts, while reducing maintenance needs associated with maintaining older infrastructure. In the interest of improving efficiencies, Parks has explored a naturalization program, which is intended to reduce maintenance inputs at park facilities and also to reduce environmental impacts associated with park operations. At Kayak Point Regional Park, for example, several edge areas exist which are not used by the public, but are currently mown. Some of these lawn areas could be replaced with shrubs or let grow long and be cut back only one or two times a year, instead of the weekly mowings that they currently receive. This change would reduce staff time required to maintain the park, reduce carbon emissions from maintenance equipment and increase space available for wildlife use, all with minimal impact to the park user. Implementation and expansion of this program will require a site-by-site analysis to identify areas suitable for inclusion in the program and evaluate potential user impacts, in order to develop a plan for execution. The benefits of this type of effort are significant and should be pursued as staff becomes available to develop plans. Parks tracks performance measures for ‘meeting service standards,’ ‘number of citizens visiting county parks,’ ‘number of new or enhanced amenities available to the public’ and ‘number of participants in recreation/education programs.’ These measurements are compiled and made available through Snohomish County’s SnoStat Performance Measure system and are reported on a monthly basis (Snohomish County). Of the four performance measures listed above, ‘meeting service standards’ directly relates to park facility condition. The benchmark/target set for this measurement is for 80% of park facilities to meet service standards. Service standards take into account facility safety, cleanliness, attractiveness and if the facility is effectively maintained. In 2011, Parks’ facilities met the defined benchmark/target eleven out of twelve months in spite of the aging condition of many of Parks’ facilities. In addition to tracking the condition of Parks’ facilities with the SnoStat Performance Measurement system, the number of park visitors is tracked on a monthly basis as well. In 2013, the total number of estimated visitors at Park facilities was 4,822,487. This includes attendees at the annual fair at the Evergreen State Fairgrounds. Attendance at parks is greatly affected by weather and peak usage typically occurs during the months of May through September. Capacity of individual parks is based on accessibility of the facility (is it open to the public), size of the park, classification (i.e. use) and amenities provided. Information on each park is included in the PIR addressing these points. ‘At capacity’ is occasionally reached in Parks’ facilities and is the point at which parking areas are full and the park is closed to additional entrants. This happens occasionally and typically occurs at water access parks during hot weather. In 2013, Kayak Point Park was closed 12 times to day-use access and camping at the park was reserved at a rate 93.55 site nights. Given that typical campground site night rates for our area range from 55 – 70, this represents extremely high usage of these facilities. As a part of the process of development of this Park Element, a Snohomish County recreation providers’ group initiated meetings in 2011 to discuss shared priorities for providing services, common challenges and opportunities for interjurisdictional coordination. Participants in these discussions included the county, cities and the YMCA. School districts, Washington State Parks, the Washington Department of Fish and Wildlife and the Boys & Girls Club were also invited to attend, but have not participated yet. The recreation providers’ group is working to seek efficiencies and to work together toward common goals. SCT is another interjurisdictional coordination effort that works at the policy level (CPP) to identify areas of focus for the different members and coordinate on larger topics of concern within the county. The CPP provide specific policies including the incorporation of UGA/Municipal Urban Growth Area (MUGA) plans into comprehensive planning as, well as encouraging joint planning and development of interlocal agreements. •There is benefit in coordinating, where appropriate, to increase efficiencies in recreation provision and create larger benefit by integrating recreation systems. •Cities and YMCAs are strong program providers and typically provide sports programs, camps, etc. •Every jurisdiction is struggling with funding issues, both for development and ongoing maintenance and operation, as well as staffing levels due to wide-spread cutbacks. •Washington State Parks continues to consider changes to their budget and staffing model, which may affect State Park provision. State Parks is not considering any park closures at this time, but there may be opportunities to work together in order to coordinate park services. •Snohomish County UGA/MUGA plans shall be taken into consideration when planning for facilities within those jurisdictions. •Cities within whose UGA/MUGA boundaries parks are planned should be invited to participate in facility planning, funding and operation efforts. •Opportunities for property transfer may be appropriate when county facilities fall within city or UGA/MUGA boundaries. •The county may have opportunities to provide grant funding to city jurisdictions for provision of parks, in particular Neighborhood Parks. Partnership opportunities for acquisition and development of needed facilities may also be appropriate. Snohomish County has previously partnered with the City of Everett and Port of Everett to acquire the 10th Street Boat launch in Everett and has also partnered with the City of Mill Creek to acquire the Tambark Creek Park site. Operational partnerships that the county has secured include an agreement with the City of Arlington for operation of Twin Rivers Park and similar agreements with the Town of Darrington for Whitehorse Community Park and with the Cities of Lynnwood and Edmonds and the Edmonds School District for Meadowdale Playfields. As Snohomish County seeks to address recreation needs, partnerships with other recreation providers will be pursued as appropriate. The potential for partnerships is significant. The five defined Recreation Areas described later in this document emphasize joint planning and coordination for the purpose of improving recreational access and the benefits that come to all communities through this coordination. As an example, creation of a plan for the Snohomish River Estuary Recreation Area will require, and benefit from, coordination with the other public land holders in the area: the Cities of Marysville and Everett, Port of Everett, Washington State Department of Fish and Wildlife and Tulalip Tribes. The Snohomish County Comprehensive Plan is current through legislation passed November 19, 2018. Disclaimer: The Clerk of the Council’s Office retains the official version of the Snohomish County Comprehensive Plan. The web version is updated as new ordinances become effective. New ordinances do not necessarily become effective in chronological or numerical order. Users should contact the Clerk of the Council’s Office for information on legislation not yet reflected in the web version.